Will Azkals' management take Younghusbands' out of their team permanently? Home » Philippine Azkals » Philippine Football Peace Cup » Sports » Will Azkals' management take Younghusbands' out of their team permanently? Even before the Philippine Football Peace Cup starts today at Rizal Memorial Stadium, Manila, earlier report says that a very controversial issue has evolve inside the Philippine Football team. 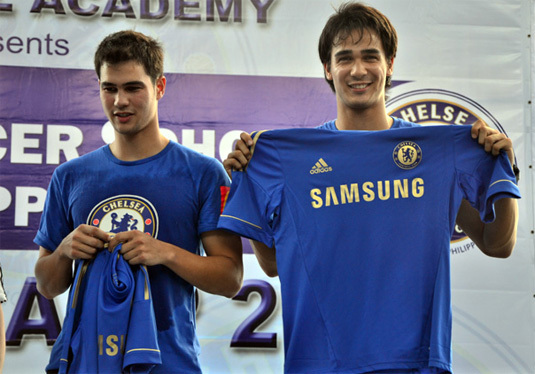 The issue is said to be regarding to the Younghusband siblings, Phil and James. Due to some circumstances, Younghusband brothers are not included in the roster's lineup in the above mentioned tournament. As the Azkals' management and coaching staff said in their official statement yesterday, "We have asked the players to give their unequivocal commitment to participate fully in the preparations... We expect our players to work harder than ever this year," and added, "Unfortunately, not everyone in the team could assure us of this; a few have already signified their unavailability for some crucial activities leading up to the tournament." Though they didn't mention any names on that matter, many assume that it was regarding to the issue of the siblings. In a statement made by the brothers, they said that the issue that brought up started after they've played an exhibition game against the Loyola Meralco Sparks of the United Football League. They were requested to play on both teams for a fair match. Phil said, "It's fair to play one half in one team and one half in the other team, that’s fair. So okay, I brought uniforms for both games." But after arriving, Phil took a call from their head coach, coach Weiss that says that he'll be just playing for sparks. The younger younghusband said, "I'm not happy about this, but this is football. He told me to tell James. Next thing, we spoke to some of the players, and the talk was that Phil and James have chosen to play for Meralco, and obviously it did not sit well with the players and the staff," and added, They thought we abandoned the Azkals, which was not the case. We were asked to play with Meralco, and upon requests we followed the coach's orders. So that caused friction between myself, James and the players." Then after that, they just heard that they will no longer be playing in the Peace Cup. Another issue is about the request made by the siblings. Phil and James have ask the PFF for an increase in their allowance, but PFF says that they cannot afford it so it is unacceptable and they both agreed to the original amount instead. Phil said, "We negotiated, then we had a meeting with the PFF and they said that our request is unacceptable. We said fine, we'll base the numbers with whatever you said before. They said we couldn't afford it. Fine, let's go back to the numbers you said," and added, "James and I made this clear – we played for the national team for free for seven years." To make everything clear, another meet up is set tomorrow for the Younghusband brothers and PFF. Meanwhile, a game match between Philippines and Guam is set to happen this evening at around 7:30 p.m (local time) at Rizal Memorial Stadium in Manila. This is still made as a preparation of Azkals for the upcoming league in AFF Suzuki Cup 2012. Comments or suggestions about "Will Azkals' management take Younghusbands' out of their team permanently?" is important to us, you may share it by using the comment box below.